Recently, I was contacted by Farfetch.com, inviting me to take part in a blogger competition styling the perfect look for Australia Day celebrations. Now, you know how we roll at Almost Posh and this is obviously way WAY out of the usual budget for Posh Picks. Let me bring it back down to earth by showing you what I actually wore on the day. 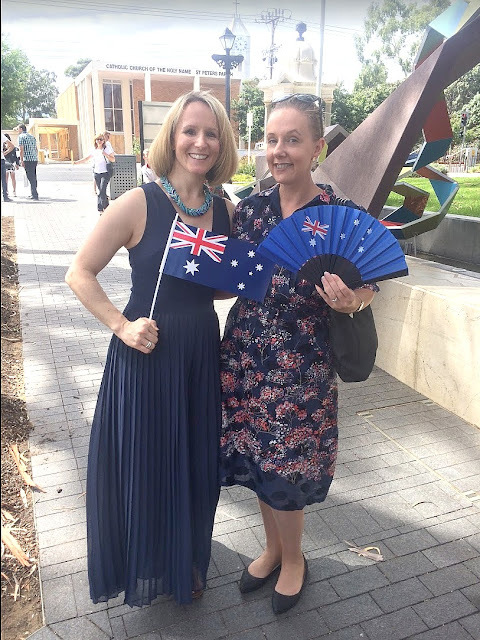 My Australia Day this year involved attending my English friend Claire's citizenship ceremony. Have you ever been to one? They are ace and full of what makes Australia great; celebrating new peeps that love the place so much, they want to be a part of it forever. The day was set to be a pleasant 31 degrees which is also great for fashion! I got this dress at Savers last week ($11.99!) It has no label so I have no idea what brand it is or whether it's vintage or newish but it's a very lightweight fabric (slip required), with a matching belt. Here's a close-up of the print. I wore it with my Nine West sparkly black flats and slung my Oroton bag over my shoulder. Here I am with one of Australia's newest citizens, Claire. Please note Claire's amazing dress that is not a dress at all, it is in fact, a jumpsuit with amazing pleated flowy legs. I never thought I could do a jumpsuit but I want this one badly. A fellow bargain hunter, Claire scored this at Marks & Spencer for £25 down from £75 which translates to about $51AUD. What a score. I hope you enjoyed your day and celebrated what is important to you.